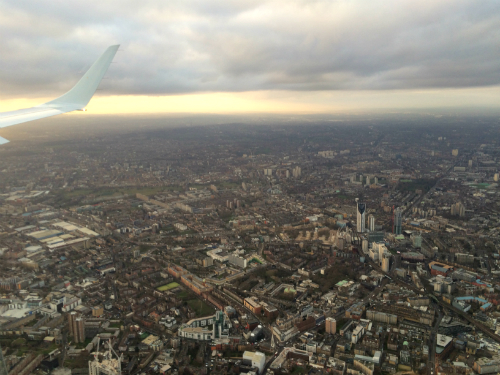 We took off – which is a wonder itself, of course. However solid the physics may be, aviation should surely feel barely-credible. But it’s when you get up there that the magic really happens; or rather, can be perceived. It’s regular magic, as regular as the rising of the sun, which was occurring on my left hand side. Seated on the right of the plane, I stared out of the window like a child. I think this is the best way to fly. 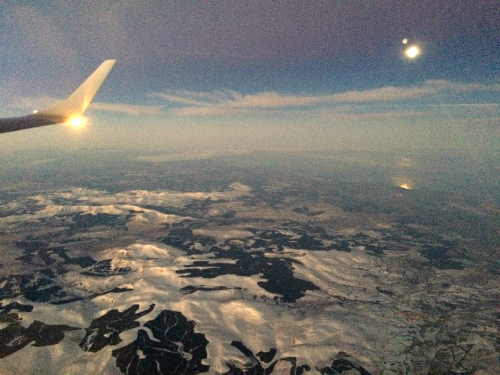 Fellow-passengers watched films on their phones or typed reports on their laptops; I saw the moon shine on the sea as the earliest rays of the sun brought colour to snow-covered hills. The grainy photo above does not do it justice. It was a scene that should astonish, and I let myself be astonished. I love wonder: wide-eyed joy at the state of things. I have had many teachers. My parents are great celebrators, delighting in delighting. John Piper – following C.S. Lewis, G.K. Chesterton, George Müller, and the Westminster Confession – showed me in Desiring God that delighting in God was the greatest good: “God is most glorified in us when we are most satisfied in Him.” I didn't have to finish the book to get the point, and have lived happily with it for a decade or so. Before I go to sleep I usually write down the things that I'm thankful to God for from that day. Wide-eyed joy doesn’t make us blind to suffering, unsympathetic or insensible to the shocking horrors and routine tragedies of our present infected age. But it does refuse to let them have the final word. For one thing, the thrill of discovery and improvement can be motivated by wonder. For another, I don’t believe that sadness is the conclusion we are headed for, or that disappointment is the definitive nature of things. The universe belongs to God: He sets its tone, and He is full of joy (Psalm 16:11, Luke 10:21, Galatians 5:22, et. al.). Broken though it currently is, He is in the process of making all things new (Revelation 21:5), This is truth which should be received with wonder, and encourages its cultivation. We seem very good at spotting what’s wrong. Almost everything that happens on the internet can be fitted in to a common timeline: discovery – celebration – fault-find – discard. Undoubtedly there are abundant faults and foolishness, but the relish with which these perfectly obvious problems are found out – human being acts selfishly shocker, etc. – seems out of all proportion to the significance of the discovery. It’s as if politicians in election season are our model. There is certainly a place for criticism when the emperor really has no clothes on, but I’m not sure that’s fitting as our default outlook. Look for the good and say “Wow”, a word whose very mechanics of pronunciation feel appropriate as we almost inhale the goodness. I’m writing this as the sun glints off the plane’s wing, just before we plunge into a cloud, whereupon the sights of London will greet us. London: proud, unjust, bloated, but worth a “Wow” as well, I think. As are the clouds above it and the people in it. "Wow" and then, "Thank You."